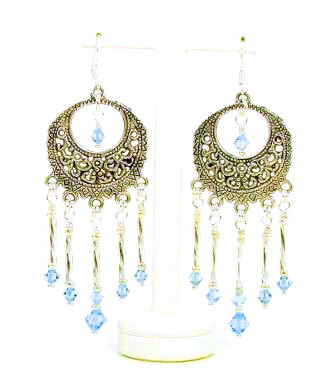 DIY Earring Making: Chandelier, Wire, Felted, Silver Smithing and More. Love this website? Give us a "like"
Earring making is a great for the impatient crafter to complete something quickly and wear it in minutes. Fast, fun, and relatively inexpensive. Enough yammering. (I'm impatient too). Let's get moving and earring making. 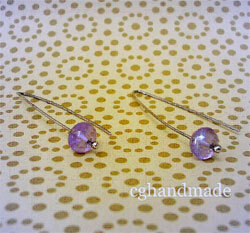 Another thing on my ever growing to-do list - make more of these here earring tutorials. But the few that are here are pretty darn nice. 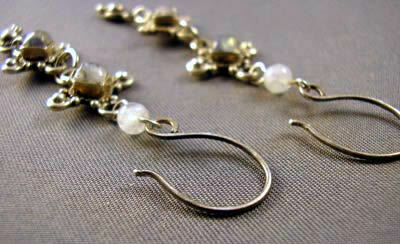 Learn how I make my own handmade earring wires. Are you a jewelry artist? I'd love to post one of your projects on How-to-Make-Jewelry.com. Guest tutorials are a great way to get a valuable backlink to your website, and get the word out about your creations. Caution: Should your tutorial be accepted, fame and fortune may ensue. Please don't hold me responsible should you become overwhelmed by enthusiastic emails, avalanches of orders, and jewelry artist groupies. These Sterling Silver and Garnet Earrings earrings have long been a favorite of mine. Perfect for someone with short-ish hair and who is on the petite side (like me). 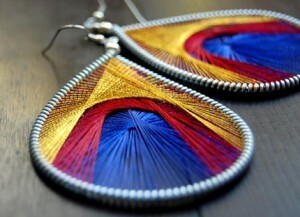 Peruvian string art earrings are kinda neat. I sometimes get questions about how to make them. Here's a video tutorial and some other information on how to make string art earrings. These "mod" earrings are really easy to make and take only a few minutes once you've gotten the hang of them. 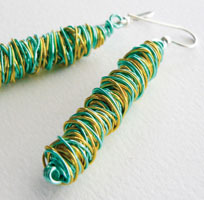 These crafty wire-wrapped earrings are sheik and fun - and very easy to make, too! Thanks to Heather Saxon of Hotwired Beads for this tutorial. These spunky and cute felted cherry earrings are fashionable and fun to make. Another great tutorial by Heather Saxon of Hotwired Beads. Here are some great books to check out if you're interested in learning more about earring making.